Peel the squid and put it in saucepan with 30 ml sake, and boiling water, and simmer for 2 minutes. Drain and hand dry the squids with damp cloth; alternatively sprinkle the rice vinegar all over to retain the whiteness. Chop the flaps and tentacles. Put the remaining sake, sugar soy sauce and mirin in a saucepan, mix and bring to boil over moderate heat. Add the chopped squids flap, tentacles and minced chicken and stir very fast with a fork until mince turns white. Then take of the mince and keep aside and again reduce the remaining juices to saucy consistency then put back the mince into it and cook till it soaked the juices. Make the vinegared rice (sumeshi) (see the Recipe) when the rice is warm ford the dry cooked meat mince to it. 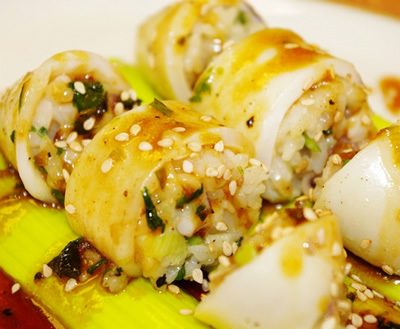 Tightly fill each squid body with half the rice mixture and cut with sharp knife into 5 - 6 roundels of a squid. Serve it with pickled ginger.